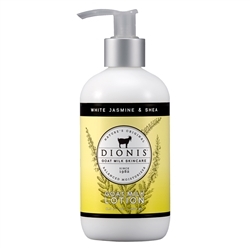 Dionis Goat Milk Body Lotion in White Jasmine & Tea smells delicious and leaves hands feeling soft and supple. The lotion sinks immediately into the skin, so that skin is not left feeling greasy. Skin is hydrated, moist and beautiful. Use as needed, wherever you have dry skin. All over the body is most appropriate with this product. I love it and think it could go even deeper with its hydration, as my skin is particularly dry. But, that is why I am glad they have the hand cream, which is better for drier skins. Goat milk offers benefits not found in traditional body care products. There is a reason that skin feels soft and stays that way when you use these products! The pH of goat milk is so close to that of your own skin, it absorbs easily and stays in the skin, helping to keep it hydrated and beautiful. The goat milk, and vitamins A and D also help to keep your skin looking great naturally. Dionis Goat Milk products are nature's balanced moisturizer. Fragrance Description: White Jasmine & Shea is a distinctive scent of white jasmine blended with creamy shea. Hints of vanilla bean and coconut milk complement this floral blend. This hand cream is a rich, creamy non-greasy formula that leaves skin soft and hydrated. It absorbs quickly and completely, leaving skin feeling soft and supple, not greasy at all. It helps to keep hands moist and beautiful. Use regularly whenever you have dry skin. I love how it keeps my hands so soft and hydrated, better than any other hand cream I have tried. At Dionis, they know that when your skin feels good, you feel good. Goat milk offers benefits not found in traditional body care products. There is a reason that your skin feels soft and stays that way when you use their products! The pH of goat milk is so close to that of your own skin, it absorbs easily and stays in the skin, helping to keep it hydrated and beautiful. The goat milk, and vitamins A and D also help to keep your skin looking great naturally. 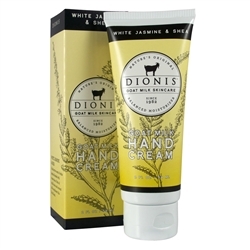 Dionis Goat Milk products are nature's balanced moisturizer. Dionis Goat Milk Skincare is available online at www.dionisgmskincare.com and at www.ulta.com. It is also available in some Ulta and Cracker Barrel stores.